I previously waxed lyrical about the Sienci DIY milling machine in DIY CNC Milling machine. Well since that particular post I have received pretty much all of the parts I need to build my own (improved) version. 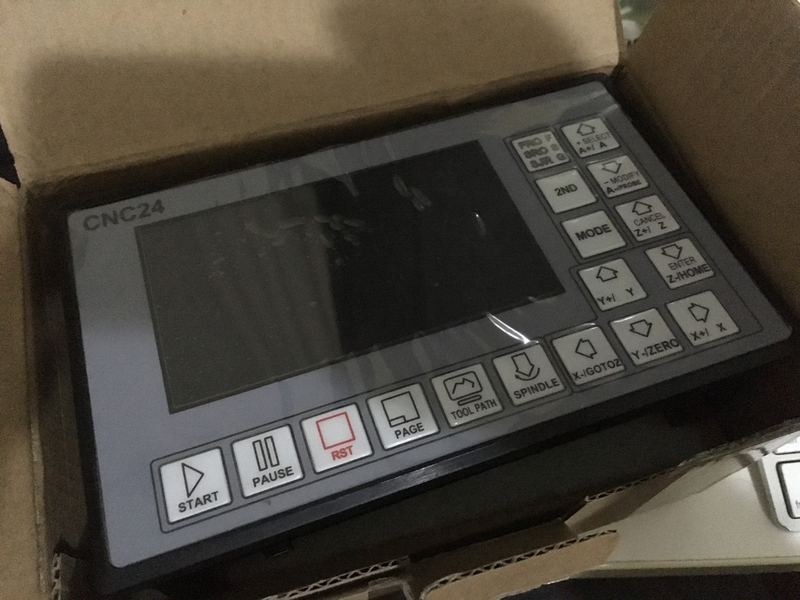 The biggest diversion away from the original Sienci machine is that I have decided to use a standalone dedicated controller instead of the Arduino Uno used by the original Sienci. I have coupled this with some 3.5amp stepper drivers and some 2.8amp Nema 24 motors. Unfortunately the motors were lost in transit and the vendor refunded my my money. So having to re-order motors I managed to find a set of slightly larger Nema 24s that ran at 3.5amps (and 3.1nm) which are the maximum that I can run on the stepper drivers that I purchased. (The stepper drivers will peak at 4amp but we should be looking at working to a max duty cycle.) At any rate the larger Nema 24 motors are much bigger than the previous Nema 14s used by Sienci and offer obvious advantages when milling aluminium an other harder materials. The other aspect that I modified to suit my applications was that the leadscrews used by the Sienci mill were obviously not the best solution for backlash. I decided to shell out the extra cash and buy in pre-made (but longer) ball screws. I've opted for 700mm by 500mm by 400mm on x,y and z respectively. This will give me the extra work envelop that I need. At this stage I am still waiting for the new Stepper motos to arrive before I get stuck into the build. Hopefully they should be here next week.